Many people struggle to learn to read and play music, and many give up before they become proficient. Could a better notation system make reading, writing, and playing music more enjoyable and easier to learn? We think so. Here is a chromatic scale on a traditional diatonic staff (above) and the same chromatic scale on a chromatic staff with five lines (below). This is just one of many versions of chromatic staff. When you listen to the scale, which staff best represents what you hear? On a chromatic staff each note has its own line or space on the staff. On the traditional staff only seven notes have their own line or space, the notes from just one key (C major/A minor, the white keys on the piano). The remaining notes (the black keys) have to be represented by altering these seven notes with sharp signs (#) or flat signs (b), either in the key signature or as an accidental. The chromatic staff approach can make music easier to read, play, and understand by improving upon aspects of traditional notation such as key signatures, accidentals, clefs, octaves, and intervals. The rest of this page shows how. There are many variations on this chromatic staff theme, with a number of different line patterns (see Notation Systems). We use a basic five-line version just to introduce the concept, not to suggest that it is the best one. We do not promote a particular alternative notation system, but document a variety of them and teach the general principles on which they are based. There are fifteen different key signatures to memorize in traditional notation, and one must always keep the current key signature in mind while playing. With a chromatic staff this is not necessary since a note’s position on the staff directly indicates what note to play. All keys are equally easy to read. The traditional staff is based upon the notes from the key of C major and closely related tonalities. This makes all of the other keys and tonalities more difficult to read, even if they are just as easy to play on a given instrument. To become proficient in all keys one must master fifteen different key signatures which are progressively more complex and difficult to learn. On a chromatic staff all of the keys are equally easy to read. There is no need to memorize and remember key signatures. Reading music is more direct as you simply play the notes that you see, without having to filter them through a memorized key signature. In traditional notation, key signatures not only alter the pitches of the lines and spaces but also alert the reader to the music’s predominant key. With a chromatic staff, a much simpler alternative key signature system can be used for the latter purpose, helping the musician know which notes to expect. In traditional notation accidental signs must be used to represent accidentals — notes that are not in the current key signature. On a chromatic staff they are not needed since all notes have their own position on the staff, making it easier to see each note’s pitch and how it relates to other notes. Music that requires many accidental signs in traditional notation can be visually challenging to read, especially if it is in an unfamiliar and complex key signature. The rule that an accidental sign applies to a given pitch until the end of the measure, unless it is cancelled by another one, opens up room for mistakes and gives the musician one more thing to remember. There is often confusion about whether an accidental applies to other octaves of the same note (it generally does not). On a chromatic staff accidental signs are not needed because each of the twelve notes of the chromatic scale has its own unique position on the staff, regardless of whether it is in the prevailing key. This makes it easier to identify the pitch of accidental notes and to see how they relate to surrounding notes. Optional “alternative accidental signs” may be used to simply indicate that a note falls outside of the current key (without affecting the note’s pitch), or they may be used to distinguish between enharmonically equivalent notes if desired (see Enharmonic Equivalents tutorial). In traditional notation, staves that look the same may represent different sets of notes, depending on the clef symbol. On a typical chromatic staff the lines and spaces always represents the same notes, and an octave or register symbol simply indicates the staff’s pitch range. Traditional notation is commonly written in four different clefs: treble, bass, alto, and tenor. Each clef changes which notes are represented by the lines and spaces of the staff. Keyboard players have the additional challenge of learning to read both treble and bass clefs at the same time. Key signatures appear at a different vertical position in each of the different clefs (see key signatures above). On a traditional staff, two notes an octave apart do not look alike. If a note falls on a line, the note an octave higher or lower will fall on a space (and vice-versa). On chromatic staves like the one above, notes an octave apart look the same. Notes are easy to identify since a given note always has the same appearance regardless of its octave. The traditional staff is based on an odd number of seven notes per octave (a diatonic scale), which is why notes an octave apart do not both appear on lines (or both on spaces). Chromatic staves are based on an even number of twelve notes per octave (a chromatic scale), so notes an octave apart can both fall on lines (or both on spaces). Most chromatic staves “cycle on the octave” so that each octave looks the same. This allows them to be ‘stacked’ to form a continuous staff that spans two or more octaves as shown above. This accommodates the different pitch ranges of various instruments and reduces the need to use ledger lines. Intervals that look the same in traditional notation may not be the same interval. In this illustration, whole steps and half steps are visually indistinguishable, as are major and minor thirds. What you see does not always correspond with what you hear and must play. Chromatic staves represent intervals more consistently and more accurately. As shown in this illustration of a C major scale, whole steps are always two notes on two neighboring lines or on two neighboring spaces. Half steps are always one note on a line and another on a neighboring space. Traditional notation obscures the interval relationships between notes. 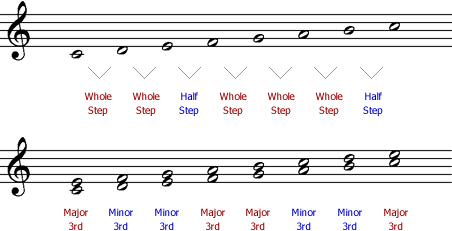 For example, a major scale (a series of whole steps and half steps, as shown above) appears as a regular sequence of notes, while a whole tone scale (a series of identical whole steps) appears as an irregular sequence. To fully identify an interval one must take into account the current clef sign, key signature, and any accidentals, going through the mental procedure of calculating the names of the individual notes before their interval relationship can be determined. Chromatic staves give a consistent and accurate representation of the intervals between notes. This clearer representation of intervals makes it much easier to recognize the interval patterns that make up various scales, or any interval pattern prevalent within a given musical genre or tradition. It also simplifies the comprehension of harmony and music theory, for example, allowing easy recognition of major and minor thirds and the chords that are built from them. Finally, it would help with learning to improvise or play by ear since these are skills that entail playing by interval relationships. It may seem that chromatic staves are only suited for atonal music, but in fact they work well with all types of music: traditional or modern, tonal or atonal, etc. They are actually much better than traditional notation at representing the diatonic interval patterns that are the basis of tonal music. Diatonic interval patterns are built into the traditional staff, obscured from view and from awareness, but a chromatic staff makes them explicit, easy to perceive, and simple to understand. See our Intervals Tutorial for more extensive illustrations and discussion. Alternative music notation systems with chromatic staves avoid each of these pitch-related difficulties, and offer significant advantages over traditional music notation. Notation Systems — Check out some alternative music notation systems. Tutorials — Learn about various approaches to alternative music notation. Arnold Schoenberg was probably the most influential 20th-century composer of Western “classical music.” It is less commonly known that he also invented a chromatic staff notation system. This quote is from his “A New Twelve-Tone Notation,” written in 1924 (see Style and Idea: Selected Writings of Arnold Schoenberg). Although Schoenberg was a proponent of atonal, non-diatonic music, his statement is relevant for all kinds of music. Most alternative notation systems were invented primarily with traditional tonal music in mind, and we are interested in making all types of music easier to read and play. Though we quote Schoenberg we do not discount the importance of diatonic scales and keys. Chromatic staff notation systems actually represent diatonic scales, tonalities, and their intervals much more faithfully than traditional notation. See Intervals on this page, and our Intervals Tutorial. Traditional notation was developed over several centuries for use with music and instruments that were different from those of today. Guido d’Arezzo introduced his staff-based system in about 1025 CE, but the five-line staff only became standardized in the 1500s. This staff-based notation was a significant achievement that improved upon the notation systems that preceded it, and it has continued to evolve over time to address new notational needs as they arose. One of the few disadvantage to chromatic staves is that they typically require more vertical space on the page, since they include five additional notes per octave. Some notation systems solve this problem, for example these notations with more than one notehead shape, Express Stave notation, and Clairnote notation.